ZillowThe redesigned house has pocket sliding doors in the living room that can open it completely to the outside. 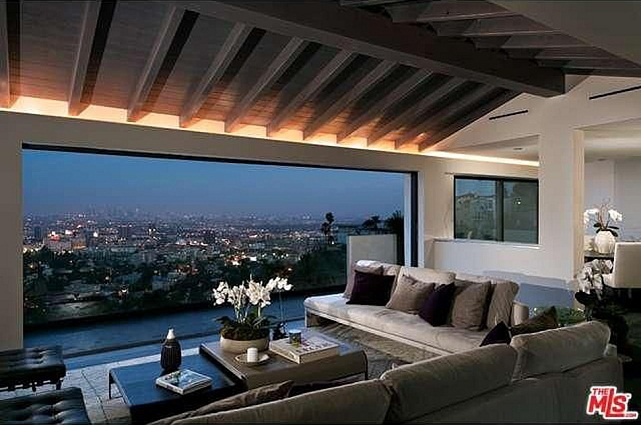 The stars who have enjoyed this view from 2260 Maravilla Drive in the Hollywood Hills are many, starting in the mid-1930s when Bela Lugosi, known for his depiction of Dracula in 1931, bought the place. In the 1940s, actress Martha O'Driscoll moved in. She was the star of "Blonde Alibi," "Carnegie Hall" and, ironically, "House of Dracula." In 1951, newlyweds Frank Sinatra and Ava Gardner moved in. It was their first home together, according to the Los Angeles Times. The home's future is likely as glamorous as its past. The 4,200-square-foot house is recently remodeled and perched above Los Angeles in Outpost Estates, a gated L.A. neighborhood that counts among its residents Ben Stiller, Charlize Theron and Salma Hayek. The redesigned house has pocket sliding doors in the living room, so that the wall between the house and patio completely disappears, leaving nothing but the view and the pool. The French-oak floors are stained gray, and the kitchen is newly remodeled. The lower level is a guest suite, and the third floor has a grand master bedroom and bath with a patio, plus two additional bedrooms. The four-bedroom, four-bath home is for sale for $4.95 million, listed by Joe Babajian of Rodeo Realty.